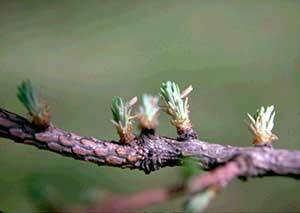 Host Plants: All species of Larch (Larix). Caterpillars of this species are very small and one of their first actions is to cut off a needle tip of the host, hollow it out, reinforce the inside with silk, and then crawl inside. This light brown, cigar-shaped case is then carried around on their backs for the remainder of the larval period. 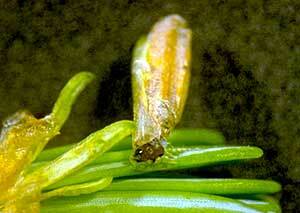 Larvae feed on the foliage beginning when it is emerging from the bud and into June (Approximately 75 -350 GDD). New needle tips can appear scorched or damage can proceed to complete defoliation, depending on population size. Repeated years of defoliation are extremely stressful for the host and may cause mortality. Usually, however, in the Northeast, damage is limited to the aesthetic. Larvae over-winter on the stems, branches and trunk of the host tree. In the spring, they will crawl to the newly emerging needle tips to feed. Pupation occurs in late-May into early June and the adult moths will be flying by late-June into early July. Eggs are laid on the needles and new caterpillars appear soon thereafter (Approximately 2375 - 2805 GDD). Newly emerged caterpillars make cases for themselves but do not create much injury to the host during that year. Before the needles fall from these deciduous conifer hosts, the larvae will migrate to the woody portions of the plant to over-winter. There is one generation per year. GDD for the adult flight period is approximately: 700-1200. The caterpillars are very cryptic and are only detectable to the trained eye. New injury in the spring is obvious and should be monitored for and detected prior to it becoming severe. Branches can be lightly shaken for the presence of adult moths during their flight period. Adults are grayish and have a wingspan of only 8 mm.